Teaching children that battles were fought by standing on opposite sides of the screen, taking turns, and that any obstacle could be overcome by spending hours baiting random encounters; what were they thinking? Today's role-playing gamers know the score. To truly succeed in battle you need to program your AI companions with the appropriate commands, spin a roulette wheel, rhythmically initiate complicated button sequences, and — every now and then — change clothes in mid-fight. Standing to the right and clicking the 'Attack' button? Who does that anymore? The old school turn-based role-playing game is alive and well on today's fancy-shmancy mobile devices with new throwbacks hitting the Android Market and iTunes on a weekly basis. Alphadia from Kemco Games is one of the latest. A hundred years after some great war ended and the nations of Alphadia settled into a peaceful co-existence, the vile Schwarzschild Empire rises, as German-sounding empires often do in Japanese role-playing games. They're tired of peace through being peaceful and would prefer that old standby, peace through tyranny. In the midst of this chaos a mysterious girl meets a band of stalwart heroes and decides to stand with them in a column as they fight their way from city to city, gathering new equipment and whatever quests might further the plot. It's all just an excuse to get four spiky-haired people on the right of the screen to wade through a colorful array of left-siders for 30 or so hours. This is the bare essence of the Japanese turn-based RPGs of our youth, brought back to life but functioning only at the most basic level. The developers did try to mix things up by assigning one of six elements to each playable character and establishing a hierarchy of those elements so someone with say, a fire affinity would be weak against an enemy aligned with water, but I've spent several hours playing now and have never had to use one of those fancy powers my characters have learned through leveling. Just tap the 'Auto' button and watch the little bastards get to work. If Alphadia had been released back in the days of the Super Nintendo (prior to Final Fantasy VI, of course) it probably would have gained a cult following and today we'd all be excited about its re-release on Android. People would complain that it runs a bit too quickly (as it does on the Samsung Galaxy S II), but otherwise it would be considered a faithful port of the beloved original. 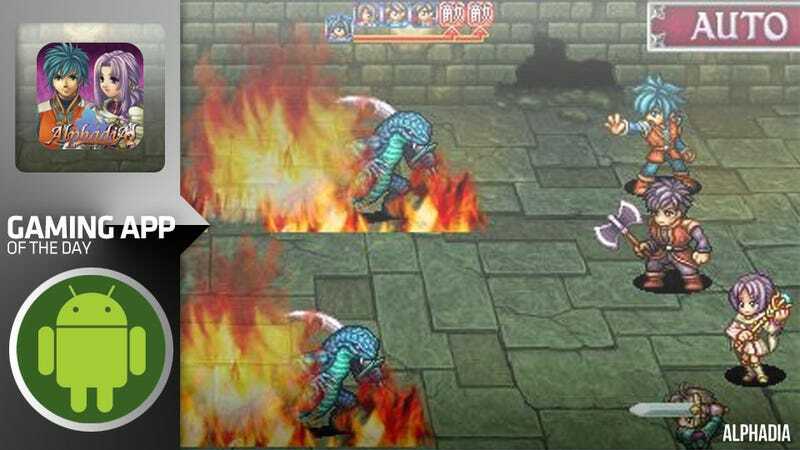 But Alphadia is new to the Android Market this month. It's got no cult following; there are no nostalgia-fueled fans chomping at the bit to play it one more time on one more device. In fact, it really doesn't do much to differentiate itself from the other old school Kemco RPGs currently on the market. It really only has three things going for it: The English translation is much better than previous releases; it's currently on sale for $3.99; and it's the latest one. And that's really as new as this experience gets; it's the newest of the old. So what good is Alphadia then? As an older role-playing game fan I firmly believe that sometimes one needs to roll things back a bit. Duck away from the complicated leveling, skill development, and combat systems of today's RPGs and get back to our roots. There's a certain mindless joy in running back and forth across a patch of pixelated forest, grinding through endless random encounters until you're far more powerful than anything the game can throw at you (the reason death spells were invented). I take comfort in knowing that the next city holds more powerful weapons and items that I'll just throw away when I reach the town beyond it. Sometimes it's just nice to see how far we've come.